The following release notes are for the Metatrader MT4 Divergence Indicator Premium. This indicator will detect technical divergences. Drag and drop the indicator onto the required chart. The default setting will use the MACD oscillator. Use the sensitivity setting to filter weaker divergence case – where the market is less overbought or oversold. The indicator can be set to use: MACD, RSI, Moving Average of Oscillators (OSMA), Stochastic, and the CCI (commodity channel index). All of these oscillators produce their own distinct divergence events. 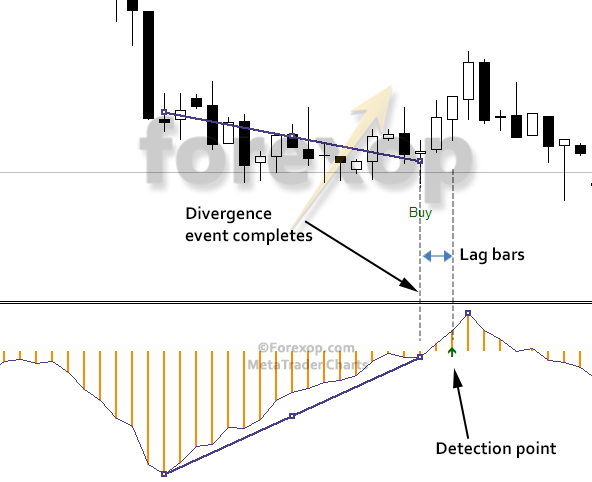 For an understanding of oscillator divergence trading please see here. Detection bars Wait bars to confirm divergence. Higher more accurate but creates time lag (see below). Max. history bars (zero for all) How many history bars should the indicator analyze? Open Metatrader’s data window (CTRL+D) to show the signal values. You can hover with the mouse cursor over any point to display the value in the data window. The buy/sell signal is in proportion to the strength of the divergence. It’s set according to the average overbought/oversold level over the recent history. Higher values mean that the oscillator is at a more overbought position. Lower values mean the oscillator is at a more oversold level. People often ask about redraws. A redraw happens when an indicator draws something on the chart in the past. In some cases redraws can’t be avoided because the interpretation of a chart pattern takes more than one bar to complete. This is the case with divergence. To help understand this, take a look at Figure 3 below. The divergence pattern here happens over seventeen bars. This pattern is shown between the dark blue lines. Further to this, the indicator uses an extra two bars to confirm that 1) the pattern is indeed a divergence, and 2) that the pattern is complete. The detection point for the complete pattern is marked with the green arrow. The arrows are always placed in real time. So these are the time points at which the trade signal and alert is actually made. The number of detection bars (lag) can be set in the configuration, but it has to be at least one bar. The labels are displayed in the main chart and the trade signal (arrows) is shown in the lower indicator window. As explained above, the arrow is the actual detection point for the entire pattern and is always made in real time. So the arrows show which time points you would actually trade. Three alert types can be configured. With the alert box, a popup appears in the terminal window whenever a trade signal appears. You can also use email alerts, or a mobile alerts. Email alerts and mobile alerts will use the settings in your Metatrader terminal (see Tools->Options->Notifications).